All of a sudden we have 2 days left of Sale-a-bration! Where did these 2 months go?! In the 2nd half of Sale-a-bration the basket bundle was introduced. What a beautiful stamp set! I just love the detail of the basket!! What's better than a free stamp set?! A matching dynamic impressions embossing folder of course!! 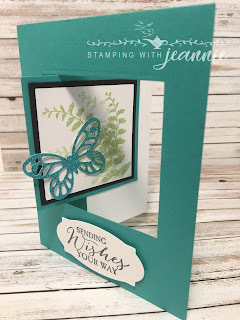 The card below was one of the cards we made in our Spring Folds card class. It's sort of a specialty card -- because of the folds, it created a shadow box of sorts. I cut 2 pieces of cardstock (Pink Pirouette for the front and thick Whisper White for the back), 4 1/4" x 5 1/2". I then scored each piece at 1/2", 1", 4 1/4" and 5". I then cut a circle out of the front cardstock piece (perfectly centered between the 2 inside score lines using one of our layering circles framelets (just pick out the largest size round framelet that fits!). After scoring, run the front piece of cardstock through the Big Shot, using the basket weave dimensions folder. Fold the cardstock on the previously scored lines -- they should still be somewhat apparent. I stamped the basket image from Blossoming Basket on a piece of vellum cardstock that was sized approximately 3" x 4". I then turned the vellum over and colored the back with various colors of Blends markers. 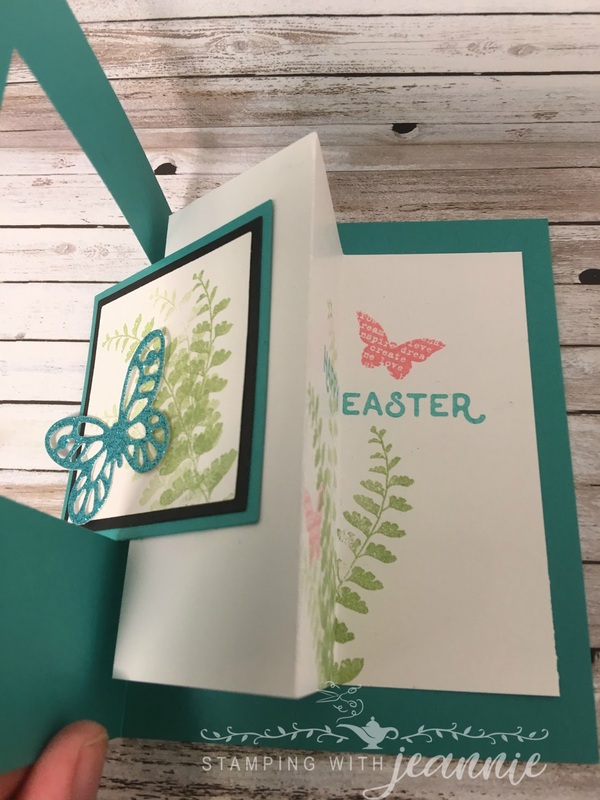 Flip the vellum back over and attach to the middle back of the card using glue dots in the corners and snail behind the basket image (it won't show through the coloring). Coloring the basket makes a sort of stained glass window effect I think. Put tear and tape on each of the 1/2" outside flaps and attach together. The method of attaching is a valley fold on the outside score lines, and mountain folds on the inside score lines, thereby creating a shadow box. The card itself folds flat for mailing, but the receiver can stand the card up easily and admire your handiwork for days!! Oh yes, I stamped the banner on Shimmery White cardstock using Black Memento ink and the Banners for You stamp set. The sentiment is from the Hello Easter stamp set featured in the Occasions catalog. One more thing -- when you decide front and back for your card, try to make sure the basket weave is actually showing on the front LOL! I missed that detail -- I discovered it when I was taking the picture! So, the moral of this story is that if you like the Blossoming Basket bundle, get it free with a $100 order by Saturday, March 31st at 11:59 PM (MT). After that, yes, you can buy the Basket Weave embossing folder in the next Annual catalog, but the Blossoming Basket stamp set will be gone forever!! Peekaboo Pandas - 3 Days left of Sale-a-bration! Isn't this a fun card?! My assistant and team member, Jaynee, helped me to design it (it was crunch time, about 1/2 hour before a class and I was struggling!). The Party Pandas were stamped on Whisper White cardstock and hand cut out. The hats were colored in with markers -- I'm pretty sure that they were primarily the Brights markers, but you could substitute any color to match your designer paper. In this case, the designer paper layered behind the Whisper White layer is also a Sale-a-bration item, Bubbles and Fizz DSP. The Whisper White layer is embossed with the new Confetti textured impressions embossing folder and the Big Shot. Next, the top was evenly punched out with the 1-3/8" Round Punch. Start by punching out your center circle, and then punch out the outside 2 circles, evenly spacing between the center circle and the outside edges. Then, "pop" your pandas inside the circles, randomly positioning them within the circles (and popping up with dimensionals) -- the bears can appear to be popping out of the circles because the hats/arms can be outside of the circles. I attached a 1-1/2" strip of the Myths and Magic Glimmer paper -- I just love the Bermuda Bay color! I hope Stampin' Up! keeps coming out with more colors! The sentiment was stamped and punched out using the Classic Label punch. You will either have to glue it or pop it up with dimensionals to get it to stick to the glimmer paper. Epic Celebrations -- 4 days left of Sale-a-bration! One of the early stamp sets offered for free in Sale-a-bration this year was the Epic Celebrations stamp set. I immediately thought this would be a great stamp set for a teenage boy. How cool!! These three cards are not my own -- they were all received in swaps I participated in this past January. The first two cards both feature our new Brusho crystals. This is another Brusho card and uses a different sentiment. It's not obvious in the picture, but I'm pretty sure that the darker "spatters" you see on this card are from the Wink of Stella pen that was "flicked" onto the card (I believe). 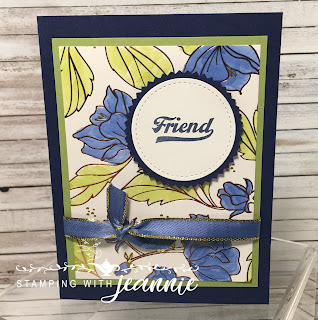 This last card features some watercoloring and our new Tailored Tag punch. The Designer paper is the Sale-a-bration Bubbles and Fizz DSP, also available only until March 31st at 11:59 PM MT. Get it while it's hot!! The "ingredient list" is not comprehensive as these were not my cards. All supplies are available in my store HERE. Lots of Lavender - 5 days left of Sale-a-bration! I truly believe that the Lots of Lavender stamp set is truly my favorite stamp set. 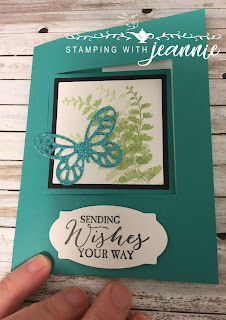 I love the two step stamping, meaning that I could use the 2nd "blossom" image as a stamp, or the buds can be colored in with markers or any watercoloring technique. Eight Days Left! Beautiful Peacock! Hi everyone!! I have to tell you that this card was totally shared with me by my upline, Marilyn. I'm not sure if it was a swap or her own creation, but it's beautiful enough to share with you for sure!! This card features the Beautiful Peacock stamp set. So ... do you count TWO Sale-a-bration products used on this card?! Let me know in a comment below!! 9 Days and counting ... Glimmer Butterfly! This is one of the cards featured in my Fancy Fold Card Class this past Tuesday night. It's called a Fancy Fold Lever card. I found the directions on You Tube, so I'm sure you could easily resurrect this card following a You Tube video yourself!! The Sale-a-bration item in this card is not so obvious. 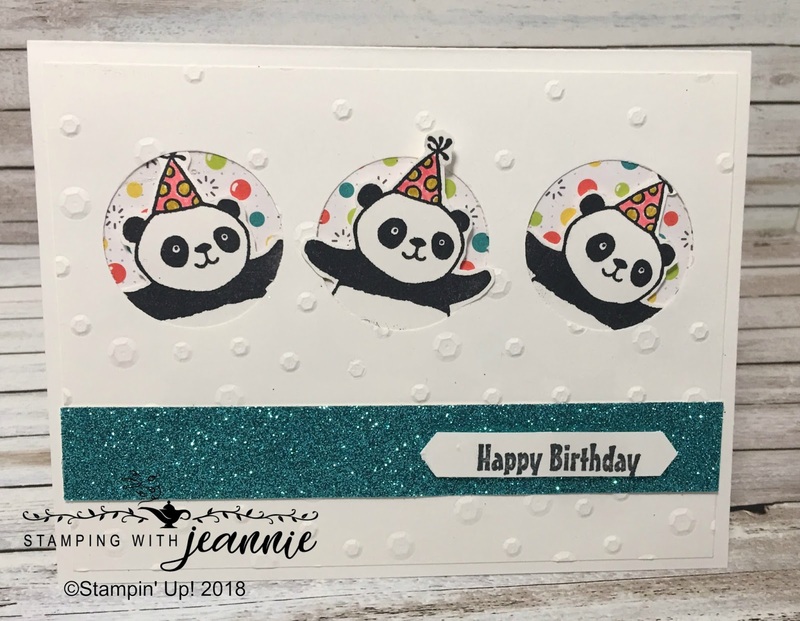 It was added on by Stampin' Up! in the third batch! You can get it for free with a $50 order, or you can buy it (while supplies last I'm sure!) on April 1st. I myself like FREE!! Here's the link to my store if you need a hint!! You might have to zoom in on the picture to see the glimmer and glitz, but it's there!! So ... do you know what the Sale-a-bration product is yet?! Leave me a comment! Here are 2 more views. See the "ingredient list" below!! With 10 days until the end of Sale-a-bration, now more than ever, you want to get the stamp sets and other items that are available only during Sale-a-bration. Some of you have seen these cards in recent stamp classes, while for others, it may be your first view. I have to say, I LOVE this stamp set called Lovely Lavender. This particular card is filled with lots of glitter and shine!! It doesn't show in the photo, but I gold-embossed the image and then stamped over with the colored ink pads. The technique is called two-step stamping. No, the images don't line up perfectly, but that's part of the watercolor-look charm!! Here is a closer view of the card. Can you pick out two items that are available ONLY during the Sale-a-bration period that Stampin' Up! does every year?! I'm going to give you a hint. Go to my store page HERE and check out the items. Then, leave me a comment and I'll choose one person to send this card to! Comments to receive this card close on Thursday night at 10 pm. After that ... PLEASE leave me comments, but I will have already chosen who I will send this card to! Check out the supplies used on this card below. 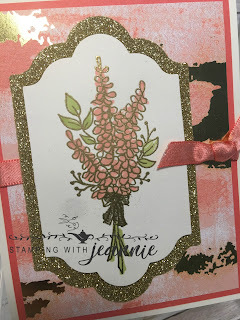 I was so excited to see the new Springtime Foils specialty designer paper option with the 2nd go-around of Sale-a-bration! What lovely paper!! It features 4 different patterns of foils/metallics, my favorite being this floral pattern embossed with copper. I know what you may be thinking -- I don't remember seeing this colored paper in the flyer ... and where did that ribbon come from??!! Well ... so glad you mentioned that!!! I love our new blends markers -- they're so versatile for coloring. In this case, I colored both the designer paper AND the ribbon!! I used the light olive blend and the light navy blend to color the paper, then used the light navy blend marker again to color the vanilla/gold metallic-edged ribbon. Now, this opens a whole new world of ribbon options!! Pictured above, I show you a closer view of the colored ribbon. Isn't it so beautiful?! And yes, I still love the paper too!! I picture a copper cross centered on the card above, replacing the sentiment, perhaps making a beautiful Easter card!! Stay tuned ... I may have that for you later this week!! Thanks for stopping by!! I hope you enjoyed this quick new tip! There are several colors of blends markers, both light and dark, opening up a whole new possibility of ribbon. Have fun experimenting! Hopefully, Stampin' Up! will have more options in upcoming catalogs!! This is the 3rd card in my "Womanly" Birthday card class. LOVE it!! (I was inspired by a VERY similar card shared by Allison Davini in a demonstrator FB page -- I changed the base of the card to match my colored flowers and I added a knot to my ribbon. )The flower DSP on the left is from the Playful Palette DSP. What?! You don't see that color in the package?! Oh, that's right! I COLORED the paper! I used my Stampin' Blends to color the floral DSP : Night of Navy light; Daffodil Delight light and Pumpkin Pie light (the peach flower was first colored with the yellow, then the Pumpkin Pie was colored over); Rich Razzleberry light; and Cherry Cobbler light. The leaves were colored with the Old Olive light marker. The DSP was layered onto Whisper White cardstock (c/s), then layered onto a Pacific Point mat (I think the measurement was 3 7/8" x 1 1/2" for the DSP with a measurement of 4" x 5 1/4" mat of Pacific Point). I layered onto a Peekaboo Peach card base (but you can choose whatever color your coloring brings out!). The Happy Birthday thinlet was used to cut out the sentiment. I used adhesive sheets under the Fresh Fig c/s scrap -- it makes adhering the sentiment to the paper super-easy! The rich Fresh Fig ribbon was tied in a knot to complete the card!! What do you think?! You can color with other colors and use other ribbon to completely change the look of the card. *Turn the DSP over after you've finished coloring it! The result is a very cool pattern because the marker bled through to the back pattern -- the pattern of the DSP on the back is so perfect for this "technique"! I stamped the "Happy" image in the center of the Lots of Labels largest framelit with Archival Black ink. Then, with my stamp-a-ma-jig, I stamped the "wishing you a ..." and the "birthday" sentiments. 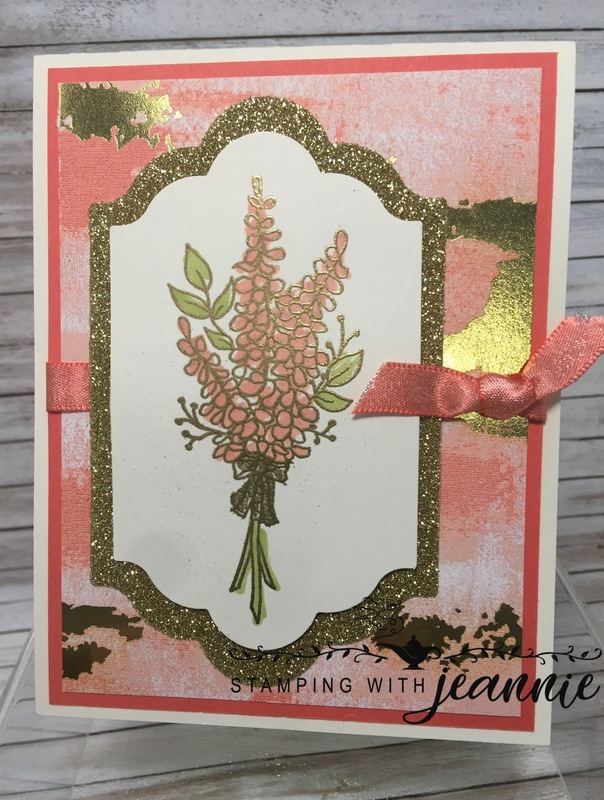 Coloring in the flowers was fun and easy -- I used a few of the Stampin' Markers: I believe I used Peekaboo Peach, Flirty Flamingo, Tranquil Tide and Berry Burst for the various flowers. The green background DSP is Daisy Delight DSP -- I have quite a bit of this paper left over because it's one of my favorite patterns. I decided though, it does me no good in a package!! Jeanne Nielsen, Independent Stampin' Up! Demonstrator, I am responsible for its content. Stampin' Up! does not endorse the use of or contents of the classes, services, or non-Stampin' Up! products I may offer here.